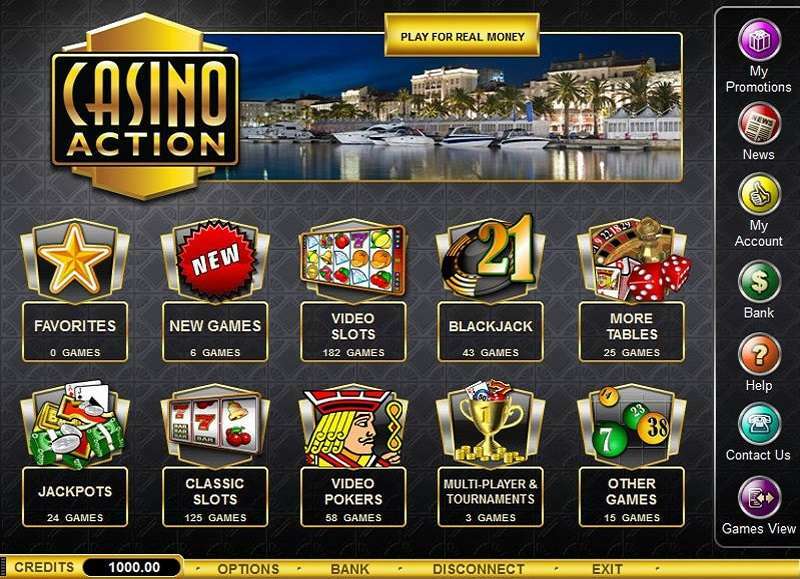 Casino Action, like its sister company, is a member of the Interactive Gaming Council or IGC. It has changed its name to Internet Gaming Council. What it does is to watch over online casinos to advance the interest of players. It is not the first time that scrupulous companies have duped players of their money, either by banning them or restricting access to their funds without providing any explanation. While doing this Casino Action review, we found out that it also supports advocacies related to problematic and underage gambling. In its website, it links to Helping Hand and Gamblers Anonymous—organizations that help people with gambling problems. Apart from these, the company also takes fair gaming seriously. It has employed the services of third-party auditors. These auditors review the credibility of the Random Number Generators that run the games of the casino. The results of these tests are published frequently on their website. The casino’s website does not indicate who owns it. But further investigation reveals that it is owned by Casino Rewards Group (CRG). And despite the absence of sensible information that will show the company’s background, it claims that is has been in operation for decades and that it has served millions of satisfied customers. CRG is a major player in the industry. It operates 29 online casinos, and it has been in business for 15 years. It is in close partnership with Microgaming so all of its gambling businesses are powered by Microgaming’s software and gaming platform. 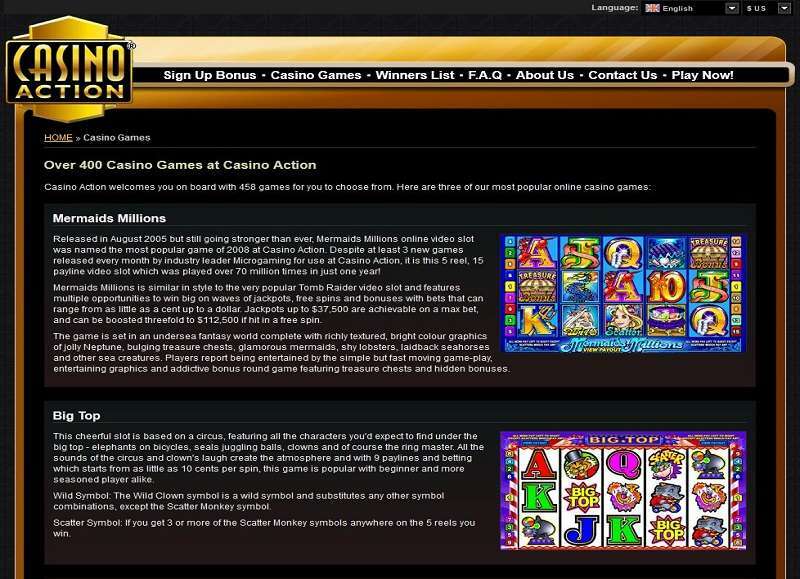 Casino Action hit the online world in 2004. It was only in 2009 before it became affiliated with CRG. Fast forward 14 years after it hit the online gambling scene, it is regarded as one of the most trustworthy casinos on the internet. Add to that the fact that it works with a big name like Microgaming, then you have a powerhouse of a casino to be reckoned with. The VIP program has six tiers. And each player earns points as he plays. However, the rules of the point system are not present on the website. What we know is that every 100 points are equal to $1. This is redeemable from the platform provided that you have a minimum of 1,000 points. The Welcome Bonus of Casino Action is a little tricky. Unlike others, the sign-up bonus is not a direct proportion of what you deposited against what was advertised. The value shown on the website is €1,250 free bonus. But it works as a progression of five deposits and the breakdown is shown below. 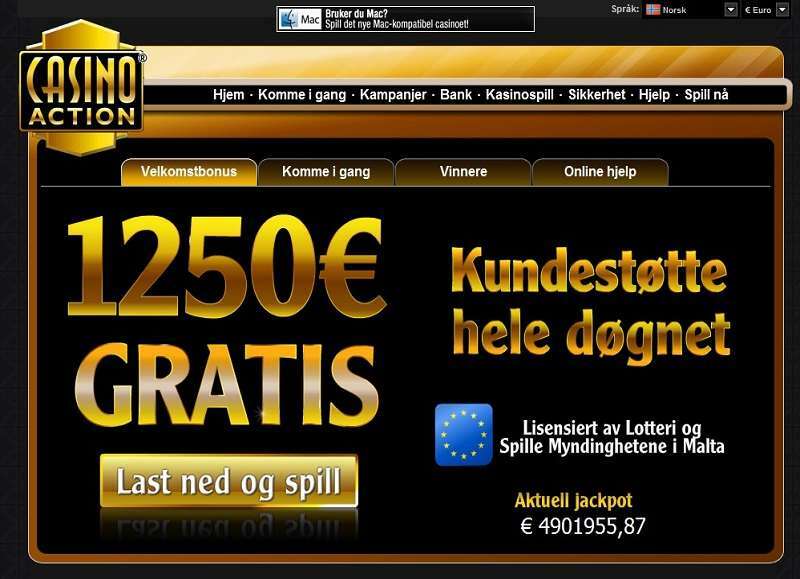 If you do the math, you need to deposit a total of €3,200 to get the advertised free bonus. One thing to note is each deposit value is counted as one deposit and not accumulated. So if your first deposit is worth €5,000, this does not qualify you for the €1,250 promotion. You need to deposit five times, separately, with values that match the deposit terms. Here is your guide to be able to get the full promotion. And before we forget, the first deposit is subject to a 60x wagering requirement. The subsequent deposits need to meet a 30x wagering requirement before cashing in. There is no listed promotion on the website except the VIP promotion. However, there is no available data as to how this works. Only those who want to play with real money have access to the VIP structure, weekly, and monthly promotions. They offer more than 500 games. And they introduce new ones frequently. Below is a summary of what they have to offer. The games are available on computer browsers and are 100% mobile compatible. No download is required for some games. The table below shows the number of games and how they are split between no download and with download. The withdrawal process and timelines are also the same as with the other businesses of Casino Rewards Group. You may withdraw through the following options. The primary withdrawal method is always the deposit method. The problem here is that they do not allow withdrawals in many deposit channels. If this happens, the withdrawal option left for you will depend on the casino. E-Wallets – this refers to financial institutions like PayPal and Skrill. Withdrawal may take 24-48 hours. Credit and Debit Cards – the process to transfer can take five business days. The catch here is that this withdrawal timeframe only refers to the transfer between the casino and the credit card, but it does not include the amount of time it takes for the credit card company to actually reflect it in your account, which may take 30 days or more. Bank Transfers – this can take 6 to 10 days. Bank Check – the longest period this takes is 21 business days. The shortest you have to wait is 10 business days, which is similar to two weeks. You need to factor in holidays in the wait time. If you are from Canada, you only have three withdrawal options. Skrill – used to be Moneybookers. OCT – this is an option for Visa. The withdrawal is processed as a credit to your card. Again, this credit may take more than 30 days. CAD EFT or Echeck – make sure you have the routing numbers or your withdrawal will be delayed. The routing number is comprised of eight digits. The number for Europe is 0800-91-7181 and it is not toll-free. Same goes for international calls with the number 1-888-942-7466. The casino is a partner of Microgaming, a multi-awarded software company that launched the first true Internet casino back in 1994. It is also the company that developed and launched the first true mobile casino software back in 2004. It is one of the biggest game developers for casinos in the world. Its popularity stems from the fact that its best games generated the biggest jackpot in mobile gaming, which amounted to £3.7 million. It is also the title holder for the biggest online bingo jackpot, pegged at £5.88 million. Overall, the casino provides a multitude of games to attract different players. The website itself is easy to navigate and is not cluttered with distracting promotional materials. The black background is coupled with a gold theme, and this gives an air of elegance and class. One thing that the Casino Action online does that many other peers don’t is the affiliate program. They reward people who promote their business. What this casino lacks is transparency. Any person scouring the internet for good casinos who comes across this is likely to go away. The only promotion that is visible to a passer-by is the Casino Action bonus. This isn’t much for anybody since all casinos already offer this. It is like as if a welcome bonus has become an expectation in the industry already. The casino does not elaborate on how it plans to reward its loyal players. It seems that the operators would rather risk having a dissatisfied customer than flaunt their promotions. The VIP program is vague, to say the least. In addition, the rules like the wagering requirement are tucked away in its web pages, unlike other casinos where they are prominently displayed. Lastly, there is really no display of the available games. 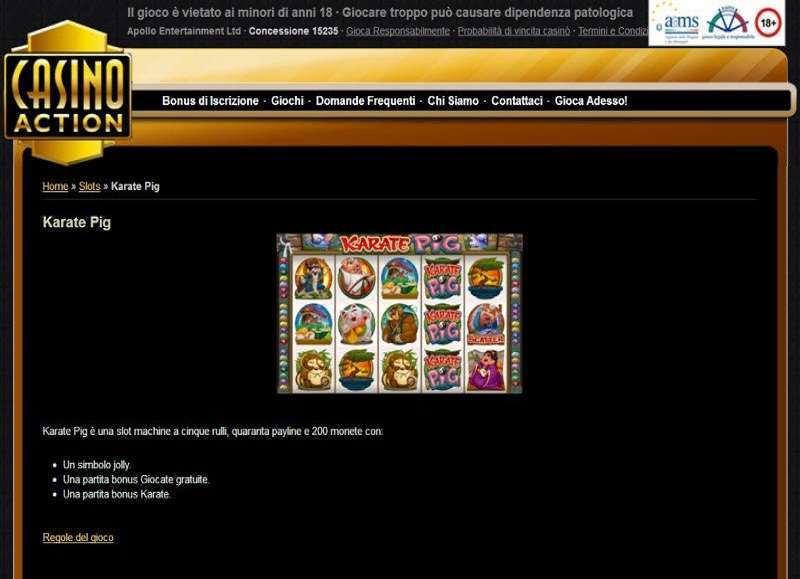 If you go to the website, there are banners indicating that the company offers attractions like poker, slots, and roulette. However, these pictures are not clickable. The only way to find out whether this casino is worth your time is to register for an account and deposit your money.